We are busy people leading busy lives, and it seems we have less and less time to take care of ourselves and what's important. We need proper nutrition, exercise, sleep, and healthful living, but our work-life balance scale is more often than not tipping in the wrong direction. Too much work, stress, and running to keep pace with daily life is taking its toll on our health and wellness. To that end, subscriptions are popping up like never before. From groceries and locally-grown organic produce to ready-to-cook meals, and even all you need for your pet, chances are good there's a subscription awaiting. You can sign up for pretty much anything to be delivered to your door these days. Enter Olly Multivitamins. They are no exception. 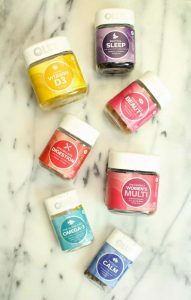 You can now sign up for an Olly vitamins subscription (though you can pick them up in a brick and mortar store or online too. If you don't like subscriptions), making getting your daily dose of nutrients and vitamins as easy as picking up the morning paper. But how do they stack up? Read on to find out. Created by Eric Ryan, the co-founder of Method, the environmentally friendly personal care and household cleaning product company, Olly is the latest wave to hit the supplement market, one that hit over three billion last year. And the wave has taken that market by storm. 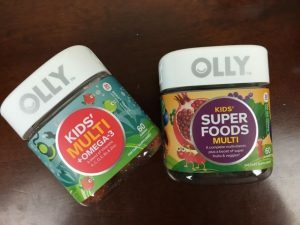 Olly Vitamins is geared toward millennials and specializes in wellness products for better living. They sell a wide variety of products in their line, from plant-based protein powder to probiotics, smoothies, energy boosters, and of course, multivitamins. Each multivitamin created with a purpose—either for girls, women, kids, and men—or for an issue, like stress, energy, skin care, and sleep. They're all gummy vitamins, so there's no choosing caplets or tablets. The success of Olly is undeniable. In a market already saturated, they went from brand new to turning a profit in a year. They focus on the retail channel and brick and mortar stores, like Walgreens, Walmart, CVS, and Target, who often offer a coupon, but are available online as well from Amazon and their site. And if you like the convenience of delivery, you can just subscribe, and they'll show up at your door. You can mix and match the types and formulas you want, so you're not stuck with a bottle or more of a certain kind you'll never use. And you can cancel at any time. 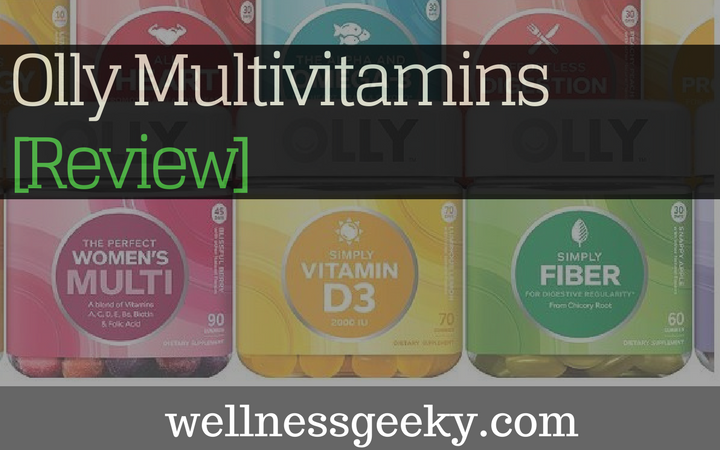 You can choose from nine different types of multivitamins from Olly. While some are for enhancing your wellbeing, like providing better energy or sleep (called wellness boosts), others are for each member of the family. Restful Sleep is made to do just that. It contains Melatonin and botanicals like chamomile to calm your mind and body and ease you into a more restful night of sleep. Endless Energy adds a dose of caffeine (via green tea) to the blend of B vitamins and L-theanine (an amino acid that boosts your focus and mental acuity). There's also a probiotic for gut and belly health, and a Vibrant skin supplement to keep your skin clear and glowing. 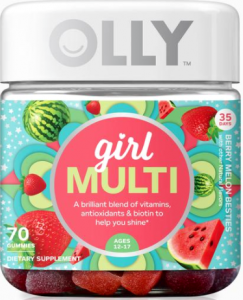 Undeniable Beauty includes biotin for healthier skin, nails, and hair, as well as borage oil and vitamin C.
The Olly multivitamin for women is called the "Perfect" Women's. It's formulated for an active lifestyle, intended to boost energy and keep you going throughout your busy day. It not only contains the usual suspects when it comes to a multivitamins B12 and B6, D3, and E but also Biotin and Folic Acid. It comes in a flavor called blissful berry, derived from raspberries, blueberry acai, and blackberries. There's also a superfoods version, which includes in addition to the vitamins, a host of antioxidant phytonutrients, such as tamarind and papaya. The superfoods version is elderberry flavored. The Prenatal come in a citrus flavor, which is a blend of Meyer lemon, clementines, and ruby red grapefruits. They boast Niacin and Folic Acid, as well as vitamin D3, C, B12, and B6. 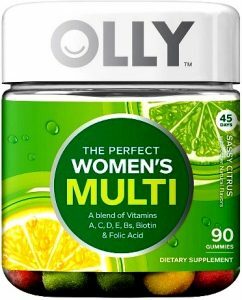 For men, they offer two choices, a superfoods version, and the Olly men's multivitamin, also labeled as "Perfect." As you can guess from the name, the superfood version has your daily dose of vitamins and minerals, plus the added benefits of Olly superfoods, specifically acai, watercress, elderberry, beet, grape, pomegranate, papaya, wheatgrass, and tamarind. The Perfect Men's Multivitamin contains 100% of the daily recommended doses of vitamins A and E, 125% of vitamin C and vitamin D, and 250% of vitamins B12 and B6. Growing girls, whether tweens or teens, have it's own specific dietary and nutritional needs, given the rapid growth, not to mention hormones. The multis for girls, in a berry melon flavor, in addition to a combination of 15 minerals and vitamins. Contain Biotin for nail and hair health, B vitamins for energy and cell support, and antioxidant vitamins E, C, and A to keep hair and skin healthy. The lineup wouldn't be complete with a complete multi formulated for children. With the intention of making all that good stuff we need, which comes in tastes only grownups like, like broccoli and kale, with flavor kids love. Namely, sweet: berry punch. Blended with all the essentials Bs, plus vitamins D, C, A, E, and Zinc. They also contain probiotics for gut health and an immune system boost. Reviews of Olly multivitamins are predominantly positive. Customers report having increased energy and more restful sleep as a result of a daily regimen of Olly. And with an average score of four stars, there are decidedly more people who give it 5 stars than those who give it one or two. As can be expected when anything has a flavor, the reviews mixed on that front. Some reviewers love the taste and others say it tastes "like a multivitamin." I think that probably makes a bit of sense, but I can see the point. If you prefer a gummy and are going for a burst of berry, orange, or the like, a lot of people would prefer to find nary a hint or trace of that obvious vitamin bit. As far as an Olly beauty vitamins review tally, the consensus is overwhelmingly positive. Restful Sleep, Undeniably Beauty, and Women's Multi, separately and in combination top the list for the most preferred and highest level of reported customer satisfaction. Since side effects are uncommon with any multivitamin are very rare, besides taste, negative reviews regarding side effects couldn't be found in our research. A common side effect in multivitamins, in general, is a stomach ache, but that's usually due to ingesting them on an empty stomach and is rarely found with a gummy form. Since vitamins are dispelled naturally, taking a higher dose should have no adverse effects or an upset stomach. More people than ever are taking vitamins, and there's no indication that that's going to let up anytime soon. In a market that might seem to be saturated, Olly is reinventing the time-tested supplements that we've come to rely on for everything from a common cold to a better night's sleep. One of the things they have in their favor is smart blending. They're also natural. Times have changed, and our needs have changed with them, so focusing their combinations in a way that requires us to think less (for example, take one for sleep, energy, or beauty) is more closely suited to the needs we have in our modern lives. The flavors are creative (and good), and the gummy form makes it easy (and delicious) to take your daily vitamins.